I got mine finished quite quickly and started J’s straight after… He wanted his to be much wider and chunkier – which caused some complications. While all this was going on, my Mum came up for graduation and oh, look more wool as she wants a scarf too. The upshot of this is that I’ve found something to keep me occupied when I’m not working and which is also productive. So I figured I’d see if I could get a book of patterns to use. After some searching (you have no idea how many naff patterns there are out there) I found a book which had a range of projects, not all of them are nice (applique flowers anyone?) but there are a number which have potential. Whilst looking for patterns, I came across a book which had knitting patterns for pets. Curiousity got the better of me, I looked in the contents just to see if there was anything for hamsters. I imagined the book would have a lot of dog coats in, that sort of thing. Even the pattern book I ended up buying had a dog coat in, charmingly called ‘Doggy Doodle’… which was immediately rechristened by my Mum as ‘Doggy DooDoo’..
Alarmingly there was a hamster-related knitting pattern. 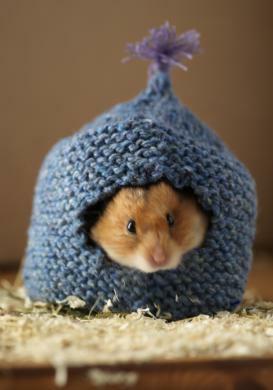 You too can knit a hamster house… the only question is why?